Researchers have documented dramatic positive benefits for native trees after the removal of invasive rats from Palmyra Atoll, a natural research laboratory and preserve located about 1,000 miles south of Hawaii. In one of only a few studies of its kind, published July 17 in PLOS ONE, scientists measured the effects of rat removal on the tropical Pisonia grandis forest at Palmyra Atoll, which provides critical seabird nesting habitat. Before removal, no seedlings of native Pisonia grandis trees were found in research plots. Immediately after removal of invasive rats, seedlings proliferated and plots had an average of 8 seedlings per square meter. For five native tree species, including Pisonia grandis, fewer than 150 seedlings were counted in the presence of rats, and more than 7700 seedlings were counted five years after rats were removed. “Once rats were gone, changes became immediately apparent. We were so excited to walk into a forest stand of towering Pisonia trees and find a mat of tiny seedlings carpeting the forest floor—something that hadn’t been observed at Palmyra in recent decades as far as we know,” said lead author Coral Wolf of UC Santa Cruz and Island Conservation. Palmyra’s tropical rainforest also provides important habitat for a native gecko, insects, crabs, and other rare species. Pisonia grandis forests are reported to be in decline globally. Prior to removal, invasive rats on Palmyra Atoll devoured native seeds and seedlings, as well as seabird eggs and chicks. Removing the rats allowed seabirds to flourish, and the rebounding native forest provides the birds with important nesting and roosting habitat. When seabirds perch in the trees, they provide nutrients to the soil below through guano droppings. These nutrients are then taken up by native plants and also wash into the ocean, where they dramatically benefit surrounding reefs. Restoring the native forest at Palmyra Atoll thus helps keep coral reefs and thriving fish populations healthy and improves their chances of overcoming changing temperatures and other climate change impacts. 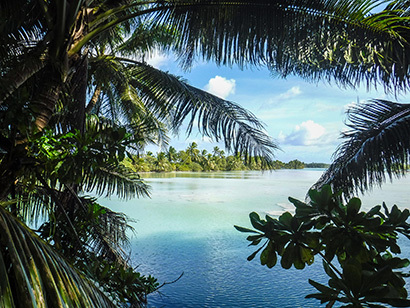 Measuring the positive effects on native plant communities like the Pisonia forest at Palmyra Atoll will help bolster the case for island management and invasive species eradication in other places around the globe. An unplanned benefit of the rat removal was the eradication of the Asian tiger mosquito (Aedes albopictus). This outcome could open new avenues for controlling mosquitoes and mosquito-borne diseases elsewhere. Two land crab species were observed for the first time on the atoll’s islets after rat removal, bringing the number of land crab species at Palmyra to nine. Land crabs are the indigenous engineers of low-lying tropical oceanic island ecosystems, and now Palmyra has one of the world’s most diverse and best protected land crab communities. “In an age of well-founded concern about the environment, Palmyra Atoll’s response to the eradication of introduced rats reminds us of the resilience of intact ecosystems and gives us hope for a better tomorrow,” Wegmann said. 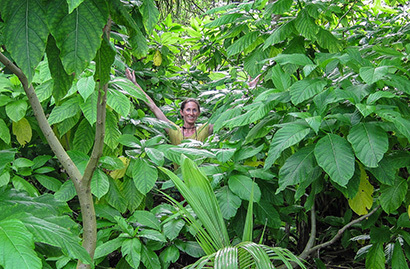 The team of researchers conducted pre-eradication monitoring of trees at Palmyra Atoll in 2004 and 2007, and repeated the monitoring post-eradication in 2011, 2012, 2014, and 2016. Monitoring included teams of two conducting counts of seedling abundance within 55 strip transects and approximately 50 locally rare tree plots distributed across the atoll. The 2016 monitoring team of five was led by biologist Coral Wolf, who was five months pregnant at the time. Field work consisted of trudging through waist-high water and high-kicking through dense tropical rainforest. The team stayed well-hydrated by harvesting coconut water as needed. Forty-one percent of the world’s most highly threatened vertebrates are found on islands, with invasive species introduced to islands being a leading cause of extinction. Removing invasive species from islands is an effective and proven way to save the world’s most vulnerable species. To date, there have been more than 500 successful projects to remove invasive rodents from islands. The pace, scale, and complexity of these efforts are increasing in recognition of the threat invasive species pose to biodiversity. Coauthors Donald Croll and Bernie Tershy founded Island Conservation in 1994 to address these issues. They now lead the Coastal and Conservation Action Laboratory at UC Santa Cruz, where Wolf worked before joining Island Conservation. The Palmyra rat removal project—a partnership of the U.S. Fish and Wildlife Service, the Nature Conservancy, and Island Conservation—was the result of more than seven years of planning and was the first step in a longer-term effort to restore the atoll’s ecological balance.